Name: Tom Izsak. Tank Details: 54 Gallon Corner. 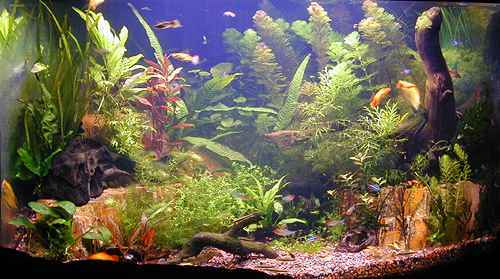 The Fish: Gold gouramis, guppies, platies, swordtails, cories, cherry barbs, neons, rummy nose tetras. Comments: 95 Watts of lighting, DIY CO2, 100% Fluorite substrate, Emperor filter.